The Richmond Amateur Telecommunications Society owns and operates two repeaters under the club's callsign, W4RAT, on the SERA-coordinated frequency pairs of 146.28/88 MHz and 442.55/447.55 MHz. Both repeaters use full CTCSS encoding and decoding at 74.4Hz. IRLP service is available on the VHF repeater. Autopatch service with emergency speed dial is available independently on each repeater for active club members. This allows RATS members to make outbound telephone calls from anywhere within the W4RAT repeater footprint. NOAA Weather Radio alerts are carried on both repeaters (this functionality can be temporarily disabled by SKYWARN Net Controls). A battery bank provides short-term power for the repeater, and a UPS provides short-term power for IRLP, streaming, and the DMR repeater. The entire system is serviced by a large diesel generator maintained by our host TV station. The VHF repeater is the primary Wakefield SKYWARN repeater for central Virginia and also serves ARES and other EMCOMM groups through written MOU's. You can listen to our repeaters online 24 hours a day. 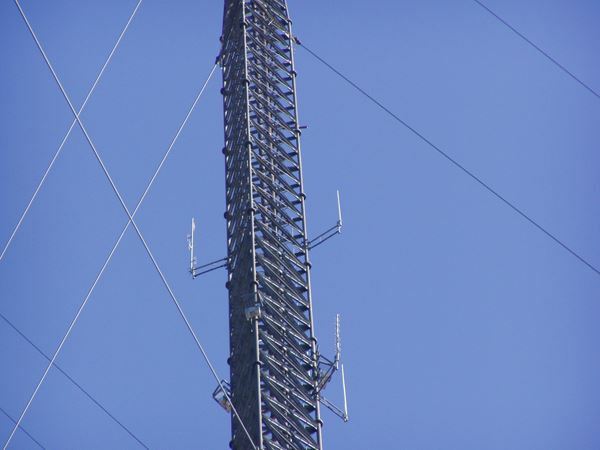 The 146.88 and 442.55 repeaters are co-located at WCVE Channel 23 in Chesterfield County (near Bon Air), with their antennas situated about 680 feet above ground on the taller of the station's two large towers. In the photo below, the upper pair of antennas are the W4RAT antennas. The one on the left is the 2m (146MHz) antenna, the one on the right is the 70cm (442MHz) antenna. RATS appreciates WCVE's generosity in allowing us such excellent locations for our antennas and repeaters. Both stations consist of Motorola MTR 2000 repeaters, full featured controllers and Digital Voice Recorders, a Duplex Products duplexer for VHF, a Celwave Duplexer for UHF, a Decibel Products DB-224-E antenna on VHF (above, top left), an RF Systems antenna on UHF (above, top right), and 750 feet of 1-1/4-inch hard-line which feeds both antennas from an RX TX coupler. Both repeaters are accessed by a CTCSS (PL) tone of 74.4Hz and transmit a 74.4Hz sub-audible tone, so you may set your receiver to break squelch only when the RATS repeaters are transmitting. You must transmit a 74.4Hz tone to bring the repeaters up! 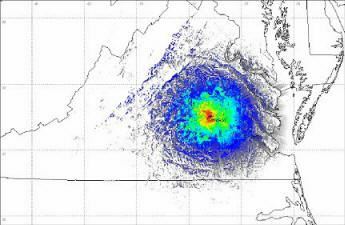 The tones are used to avoid interference from other repeaters whose coverage occasionally overlaps ours, and is suggested by the Southeastern Repeater Association, our frequency coordinating body in southern Virginia and the southeast. Each transmitter's output power is approximately 70 watts. To reduce noise, the repeaters utilize a kerchunk filter which will keep most short transmissions from coming through the repeater. Except for net modes and drive time, the repeaters do not usually transmit a courtesy tone. If you have questions about the operation of the W4RAT repeaters or to request the use of our repeater for a special event, please e-mail the RATS Technical Committee. This is the projected coverage map of the "88" repeater shown by the mapping program SERA uses.